The Center For Community Engaged Learning, formerly the Community Involvement Center established in June 2007, is a strategic partnership between Academic Affairs and Student Affairs that provides both curricular and co-curricular community engagement opportunities for campus constituents in partnership with local community organizations. Students, faculty, staff, alumni and community partners come to the CCEL to create connections and opportunities to give and grow through learning and experience, and to build a community that thrives. The main mission of the center is to engage students, faculty and staff members in service, democratic engagement, and community research to promote civic participation, build community capacity, and enhance the educational process. Since its inception, students have contributed over a million (1,052,448) combined hours of community engagement through the Center. Community stewardship is woven into the fabric and culture of our campus and has been recognized as such by the prestigious Carnegie Classification for Community Engagement awarded to WSU in 2008. Weber State University has been listed each year on The President’s Higher Education Community Service Honor Roll since the inception of the award. Weber State University has served as a lead institution in NASPA's Lead Initiative for Civic Learning and Democratic Engagement since 2012. 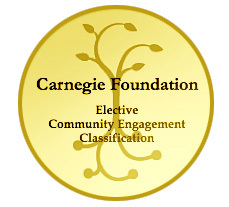 Community Engaged Learning is defined as an activity that involves a collaborative, reciprocal relationship with the community that prepares our students, faculty, staff and alumni to be engaged citizens, strengthen democratic values and civic responsibility by addressing community issues. Community engaged learning can be facilitated through: service, democratic engagement and community research. Service experiences often involve working directly with community residents to meet an immediate need. Examples of service include, but are not limited to: volunteering to serve meals at a homeless shelter, using academic knowledge to develop an electronic food-monitoring database for a food pantry, serving as a mentor or tutor in a local school or youth development program, cleaning up the banks of the Ogden River, or coaching a city youth sport. Democratic engagement experiences often involve raising awareness about issues of public concern and working more systematically through both political and non-political processes to create change. Examples of democratic engagement include, but are not limited to: attending organized discussions about pollution; community organizing; writing a letter to an elected official; engaging others in the process of deliberative democracy; or producing information about community issues. Community research experiences often involve gathering information with and for community organizations to solve a pressing community problem or create change. Examples of community research include, but are not limited to: community needs assessment survey; water quality or scientific assessment; or program evaluation for non-profit organizations.